The themes which dominated in 2018 – key elections, the direction of the dollar, commodity prices and trade talks with America – are all likely to be just as influential in 2019 as Emerging Markets try to recover from a testing year. Dollar strength, America’s hard-line stance on Iran and oil’s late-year retreat all hurt the Africa/Middle East region. 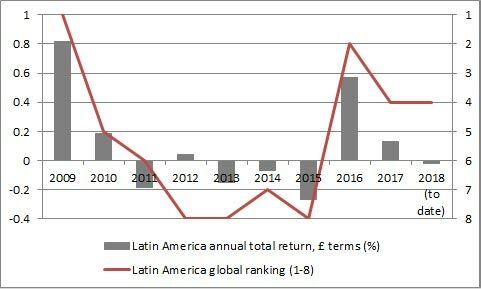 Latin America and Eastern Europe did at least manage to forge some kind of recovery from the summer’s market volatility in Argentina and Turkey respectively, even if shareholders voted to tender 61% of their shares in an offer from BlackRock Emerging Europe, persuading the money manager to offer the option of cash or rolling over any assets into the BlackRock Frontiers closed-ended fund. Fall-out from Turkey’s summer economic turmoil remains contained for now but there are no guarantees it will stay that way. A weaker dollar and stronger commodity prices could both help sentiment in 2019 while the elections due in South Africa, Argentina and Israel could also prove particularly influential. Investors will also be looking to find out how Mexico’s new President, Andrés Manuel López Obrador, and Brazil’s newly-elected leader, Jair Bolsonaro, intend to address their respective countries’ economic challenges, with the former’s left-wing and the latter’s right-wing credentials on the line. Both North Africa and the Middle East are still grappling with the political and economic legacies of 2011’s Arab Spring. Terrible hardship in Egypt and Libya, famine in Yemen and military strife in Syria mean that the benefits of the uprisings can still be hard to divine. Tunisia’s scheduled election in 2019 may at least give that nation a chance to build on its Jasmine Revolution as Prime Minister Youssef Chahed looks to keep the secular Nidaa Tounes party in power after its victory back in 2014. In Israel, Prime Minister (PM) Benjamin Netanyahu is still in with a chance of winning an unprecedented fifth term in office, overtaking David Ben-Gurion’s record of four, although the odds do look to be stacked against him. His coalition government has a wafer-thin majority in the Knesset and the PM is struggling to cast off allegations of corruption involving gifts and a submarine deal with Germany’s ThyssenKrupp, of all firms. Corruption will also be a key theme in South Africa, where the ruling African National Congress’ Cyril Ramaphosa, who took over from Jacob Zuma in late 2017, will square off against the Democratic Alliance’s Mmusi Maimane and Julius Malema’s Economic Freedom Fighters. The ANC’s polls have improved since Zuma’s fall from power and Mr Ramaphosa’s standing has benefited from his drive to stamp out graft and bring the previously all-powerful, India-born Gupta family to book for their role in the Zuma years of economic stagnation and pork-barrel politics. In Latin America, the big ballot to watch will take place in Argentina. It is not certain that centre-right President Mauricio Macri of the Cambiemos coalition will run again, four years after his first win. If he does, Macri may find old foe Cristina Fernández de Kirchner waiting for him and the prospect of a victory for the former leftist President is unlikely to sit well with Buenos Aires’ markets. It cannot be ruled out even if the former two-term leader faces a tangled legal path to even allow her to compete, as she faces indictments for fraud and even high treason. In Eastern Europe, relations between the EU and Poland are becoming ever-more strained, with the conduct of Warsaw’s ruling Law and Justice Party firmly in Brussels’ spotlight, but as 2019’s general election approaches the Sejm’s (the lower house of Polish parliament) dominant force is still well ahead in the opinion polls. It wasn’t just Argentina’s football team that had a shocker in 2018. Anyone daft enough to buy the 100-year, 7.9% coupon bond issued by Argentina in 2017 will have been cursing as a drought, strikes and the stronger dollar derailed President Mauricio Macri’s recovery plan, forcing him to call in the IMF and crushing the bond’s price and the Argentine peso in the process. 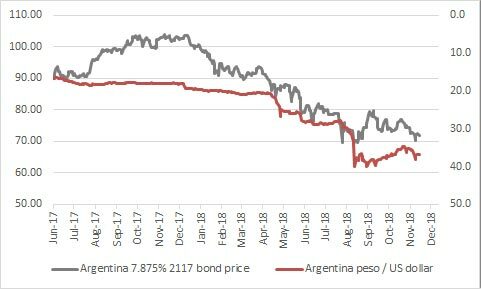 At the time of writing, the bond trades at 72, compared to an issue price of 90 and the peso has lost 55% of its value against the dollar during the paper’s life time. Commodity-price weakness and dollar strength have also left many African countries struggling to balance the books. Nigeria’s budget deficit has soared, Mozambique defaulted in 2017 and in 2018 South Africa had to force through its first increase in VAT for 25 years to help its recession-hit Government to try and balance the books. A paper released in 2018 by the IMF warns there could be worse to come. It asserts that some 40% of sub-Saharan African nations are now at risk of debt distress, barely a decade after the Multilateral Debt Relief Initiative sought to cancel the liabilities of those nations who met certain criteria. Nigeria, DR Congo and Chad are all on the IMF paper’s watch list, as are Cote d’Ivoire and Senegal and Zambia because they are finding it hard to borrow on the international markets after a plunge in their currencies against the dollar. An analysis by Moody’s has also warned that Egypt, Bahrain, Lebanon and Jordan all face “significant debt-related challenges,” especially if interest rates start to rise across the world, where America’s Federal Reserve is leading the way. Emerging Market investors will now have to ponder the implications of Jair Bolsonaro’s victory in the Brazilian Presidential Election, the left-wing credentials of Mexico’s new leader, Andrés Manuel López Obrador (AMLO to his friends) and also whether Argentina can win back markets’ confidence after an increase in interest rates to 60%, a fiscal austerity programme and a $50 billion International Monetary Fund bail-out. At least a recovery in the oil price allowed Russia to drag itself further away from the discomfort of the 2016 recession but the Central Bank of the Russian Federation’s Elvira Nabiullina got little respite. The highly respected central banker pushed through a first interest rate increase in nearly four years in September, in response to sticky inflation and a sliding rouble, as the Russian currency felt the pressure brought to bear by a rising dollar. 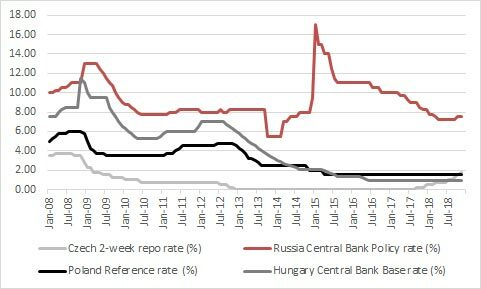 Ukraine, the Czech Republic (in response to an over-heating housing market) and Turkey also raised interest rates in 2018, to erase the narrative of falling borrowing costs which had done so much to boost asset prices and financial market performance in 2016. Emerging Markets struggled in 2018, although as the year-end approached Eastern Europe had eked out a small gain, in total return, sterling terms, to rank third out of the eight major geographic options available to investors. 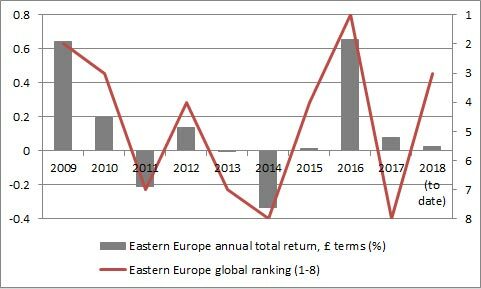 Source: Refinitiv data, based on MSCI Eastern Europe index. Total returns in sterling terms, 1 January to 29 November 2018. Latin America ranked fourth, despite a small loss, buoyed by a rally in its biggest individual market, Brazil where the headline Bovespa index cracked the 90,000 level for first time ever in December. Source: Refinitiv data, based on MSCI Latin America index. Total returns in sterling terms, 1 January to 29 November 2018. 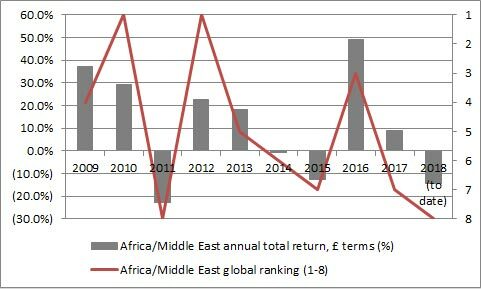 The Africa/Middle East region was the worst performer with a near-15% loss, even including dividend reinvestment. That comes after 2017’s seventh place and represents a fifth year of underperformance in the last six (with 2016 the honourable exception). Source: Refinitiv data, based on MSCI FTSE Middle East & Africa index. Total returns in sterling terms, 1 January to 29 November 2018. It remains to be seen whether the emerging markets’ struggles in 2018, following a crash in cryptocurrencies and a blow-up in low volatility strategies (notably shorting the VIX, or ‘fear index’) is a sign of gently gathering risk aversion or it is down to reasons specific to the asset class. Summer’s collapse of the Turkish lira and the threat of contagion across emerging and also developed stock and bond markets caught many off guard in what looked like another example of what the economist J.K. Galbraith once termed ‘the extreme brevity of financial memory.” Unfortunately, we have been here before. The current Turkish situation bears all of the hallmarks of the Asian and Russian economic crises of 1997-98, which finally spilled over into the West and led to a short, sharp bear market in developed market share prices. Meanwhile Turkey itself last got into serious trouble in 2000-01 when the lira collapsed as the economy over-heated after a period of rip-roaring growth funded by a rising budget deficit and rampant overseas borrowing. That all sounds very familiar today, given Turkey’s $200 billion-plus of overseas debt, inflation in the high-teens and a current account deficit that represents nearly 6% of GDP. After the initial chaos of August, common sense began to break out. 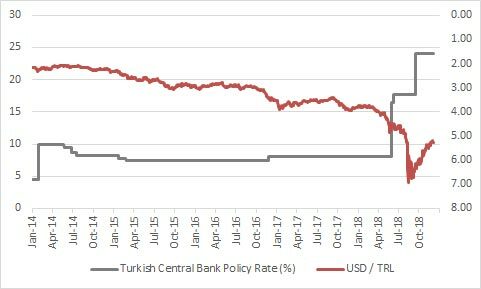 Finance Minister, Berat Albayrak floated the idea of government spending cuts of 10% to 30% and, perhaps more decisively, the Turkish central bank jacked up interested rates. That stemmed the sell-off in the lira and Turkey’s BIST-100 equity index. But Ankara has a lot more work to do. Turkey still suffers from lofty inflation, still runs a current account deficit and still has substantial dollar borrowings which are becoming still more expensive to service as the lira falls. The core problems remain. But for time-pressed investors who do not have the time or wherewithal to asset the economic and political situations of individual countries, there are two simple rules of thumb with regard to Emerging Markets which seem to stand the test of time, at least on a near-term tactical basis. 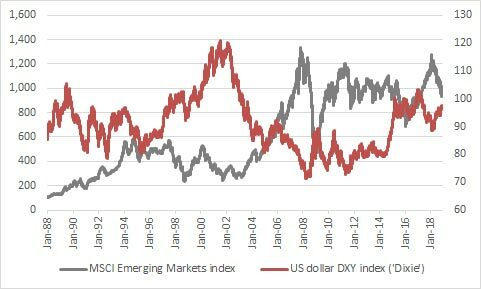 A strong dollar tends to be bad news, a weak one good news for Emerging Markets. This harks back to the 1997-98 Asian and Russian debt crises: a rising dollar makes it more expensive to service overseas debts and also makes commodities more expensive to buy for nations whose currency is not pegged to the dollar. The greenback is rising, if only slowly, but Federal Reserve determination to raise rates and sterilise Quantitative Easing (QE) could still boost the buck which, at around 95 against the DXY (or (‘Dixie’) currency basket stands way below its prior cyclical peaks of 120 in 2002 and 160 in 1985. Strong commodity prices tend to be good news and weak ones bad news for Emerging Markets. Further evidence of a strong, synchronised global recovery could therefore be a potential positive for emerging markets. Any sign of a slowdown, loss of faith in an inflationary upturn or re-emergence of fears over deflation would be a potential negative for emerging markets, even if the past is by no means a guarantee for the future. We must always acknowledge that the past is no guarantee for the future. 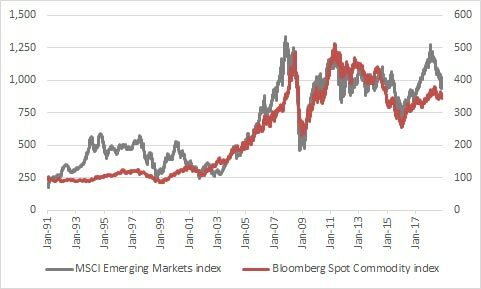 These past relationships could easily break down and investors, when they look at the MSCI Emerging Markets index on a stand-alone basis, will immediately notice how bumpy the journey can be. At least that journey has, until now, been worth it. 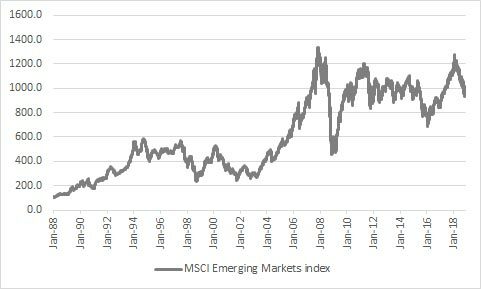 Since its inception in 1988, the MSCI Emerging Markets index has provided a total return in local currencies of nearly 2,200% (and nearly 3,200% in sterling) against 1,335% from the FTSE All-Share over the same period. Trying to time the cyclical peaks and troughs is likely to be a mug’s game but periodic panics can seemingly present opportunities, although those of a nervous disposition will doubtless focus on the dangers presented by the lengthy fallow periods of 1998-2004 and 2008-2016. And if 2018’s flap in Turkey and Argentina does spill over into something broader, or political concerns create further volatility, then any prolonged period of pessimism could make emerging markets worthy of further research, given that they generally come with superior demographics, better trend GDP growth prospects, lower debt loads, healthier fiscal balances and – to cap it all – lower equity valuations than their developed counterparts. Russ Mould has 26 years' experience of the capital markets. He started at Scottish Equitable in 1991 as a fund manager and in 1993 he joined SG Warburg, now part of UBS investment bank, where he worked an equity analyst covering the technology sector for 12 years. Russ joined Shares in November 2005 as technology correspondent and became Editor of the magazine in July 2008. Following the acquisition of Shares' parent company, MSM Media by AJ Bell Group, he was appointed AJ Bell’s Investment Director in summer 2013.